Railway RRB Group D Exam is also conducting today i.e. 25 October 2018. There are 62,907 vacancies for the Railway Group D posts. RRB Group D exam is taking place in three shift 1st (9 AM),2nd (12:30 PM),3rd (4 PM). This article covers the questions asked and expected cut off up to level candidate should attempt. Our AffairsGuru Team is not leaving any stone to analyse the Railway all shifts. All the aspirants who have still next shift exam, they can get clear idea about the exam pattern and difficult level. Candidates will also able to get PDF. 8 Railway Or RRB Group D Exam Analysis 25th October 2018 2nd Shift. 4. A person covers a 28 Km distance in the flow of water in 5 hours, and against water 13 Km in 5 hours, Speed of flowing water ? 2. 1-2 questions were related to Economy of India. 6. Full form of NRC ?- National register of Citizen. 7. Who is honored with the FIFA best player award 2017? 1. How much electron needed by the clorine to complete the Octagon ? 2. 1-2 questions were related to the SI Unit. 3. One question were related to the Stone Cancer. 4. One question related to the disease name of human body. 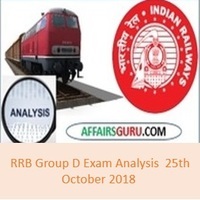 Railway Or RRB Group D Exam Analysis 25th October 2018 2nd Shift. Below are some question asked in 2nd Shift of 25th October 2018. 5. Who is honored with the 2017 IIFA Award ? 6. 3-4 questions were asked from the Time and Work. 8. Population of a Village is 25000 , 1/5 are woman of population, and remainder is men, 5% men and 40 % woman are uneducated, Find the % of educated in village ? Below are some question that are asked in the 3rd Shift of 25th October 2018. 2. A , B and C started a business by investing Rs. 26000, Rs.34000 and Rs. 10000, If the profit is Rs.35000 at the end of year then fin the share of B ? 5. A teacher said a student to multiply a number by 27, but student multiplied by 72 mistakely , answer is more that 405 from right answer, find the number which is said to be multiplied by 27 ? RRB or Railway Group D Exam 25th October Shift 1 & Shift 2 & Shift 3 is over now. So, it’s time to share your experience with the exam as it will help you know bits and parts of the exam. Share your Share your RRB Railway Group D Exam Review and know where you stand among thousands of aspirants who appeared for the exam. And if you remember any questions or the type, share it with us.